A virtual interface which can be reimplemented to receive non-XMPP Core stanzas. 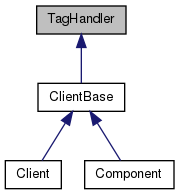 Derived classes can be registered as TagHandlers with the ClientBase. A TagHandler can handle arbitrary elements not defined by RFC 3920, XMPP Core. It can also be used to handle Tags emitted by Parser. Definition at line 32 of file taghandler.h. Definition at line 38 of file taghandler.h.